Cleaning tools such as a pool vacuum and net are must have pool accessories! Installing a pool is only the beginning when it comes to your backyard pool journey. There are so many other tools and items that you need to ensure the best pool experience. If you are overwhelmed with options when you walk down the pool aisle, here are five must have pool accessories to help you narrow down your decision. When you install your pool, the very next thing you should do is invest in a pool barrier. This is different from a pool fence because a fence still leaves the possibility for someone to enter your pool. This pool accessory guarantees that no unauthorized people will be able to get into your pool when you aren’t using it. The barrier covers the entirety of the pool and has a lock on it so that no one can get through. This is also one of the more important pool accessories because it helps to ensure pool safety. It is always best to be prepared in the case of an emergency so that no one gets injured while swimming. You should invest in life jackets for children, a first aid kit, and a life hook for people to grab onto if they are drowning. This is one of the optional pool accessories, although it does also increase the safety of your pool. LED pool lights give your pool a unique aesthetic at night time and allow the fun to continue even after it gets dark. They enhance safety because they allow swimmers to see better at night and also allow you to see your pool better from inside of your home. Without these pool accessories, your pool will become unsafe to swim in. 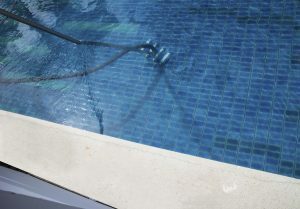 You need cleaning tools and supplies so that you can keep up with the maintenance on your pool. You need a broom or vacuum so that you can clean the bottom and sides of the pool. You should also invest in pool filters and a pool net so that you can clean debris from the water’s surface. In addition to the cleaning tools, you also need tools for maintenance.These pool accessories often come in full kits that include bolts, cut pipes, and chemical testing strips. It is important that your pool chemicals are always balanced before anyone gets into the pool. Too much or too little of one chemical can be dangerous, so a testing kit is mandatory. You may also want to invest in a drain pump to get excess debris out of the pool. This entry was posted on Friday, July 6th, 2018 at 4:00 pm. Both comments and pings are currently closed.